FAIRFIELD -- Kennebec Valley Community College is trying to ensure that it properly manages a massive and unexpected expansion opportunity. FAIRFIELD — Kennebec Valley Community College is trying to ensure that it properly manages a massive and unexpected expansion opportunity. The campus suddenly got 10 times bigger when a $10.85 million gift from the Harold Alfond Foundation made it possible to buy 600 acres from the center of the Good Will-Hinckley campus. A master plan has been completed that outlines the major changes that will happen on the campus. For the most part, the 12 or so buildings that came with the purchase will be restored and modernized. New residence halls for college students and expanded classroom space are being considered. President Barbara Woodlee said administrators were excited to witness the rapid maturity of the college, which was founded in 1970. Now, enrollment is expected to increase from 2,628 this fall to more than 4,000 after the expansion is complete. So far, construction contracts have been given almost exclusively to firms from Maine, with many of them in the immediate area, Woodlee said. The property, which is seven miles north of the college’s Fairfield campus, is undergoing several changes. The sewer systems beneath the property have been separated to serve the two distinct schools. The water systems are also being upgraded, and cables are being run to connect the two campuses. Money will be spent on significant remodeling projects at the Averill School building and the Alfond Recreation Center, where large columns at the front of the building will be repaired, an exercise gym will be installed, and an addition with a cafe will be added. Also on the Good Will-Hinckley campus, a new charter school, the Maine Academy of Natural Sciences has opened, replacing the former education program that served at-risk young people, which shut down in 2009. The former Good Will-Hinckley farm will continue as an educational center to teach students agriculture and science. The campus may upgrade the farm buildings, build a visitor’s center and establish a new sustainable agriculture program. Other proposed plans include a redistribution of parking spots from the center of the campus to the edges, which would encourage a pedestrian-friendly atmosphere, the addition of a cafeteria, a new large auditorium and a new campus entrance and drop-off loop along U.S. Route 201. While Woodlee described the opportunity as exciting, challenges are also emerging for the staff of the community college, including finding the right balance between the needs of future students and a desire to preserve the rich history that has been built up over more than 120 years by the Good Will-Hinckley school. It’s a history that includes everything from 70-year-old walking trails to a cemetery for those who wanted Good Will-Hinckley to be their final resting place. Just last week, the college’s safety and security director, Bruce Davis, discovered a memorial plaque indicating that a double row of mature oak trees had been planted in the memory of a Good Will-Hinckley supporter. Woodlee said that every effort is being made to preserve the character of the campus. The cemetery and walking trails will be protected, she said. Far from harming the Moody Chapel, ongoing restoration work will allow it to be enjoyed for generations to come. 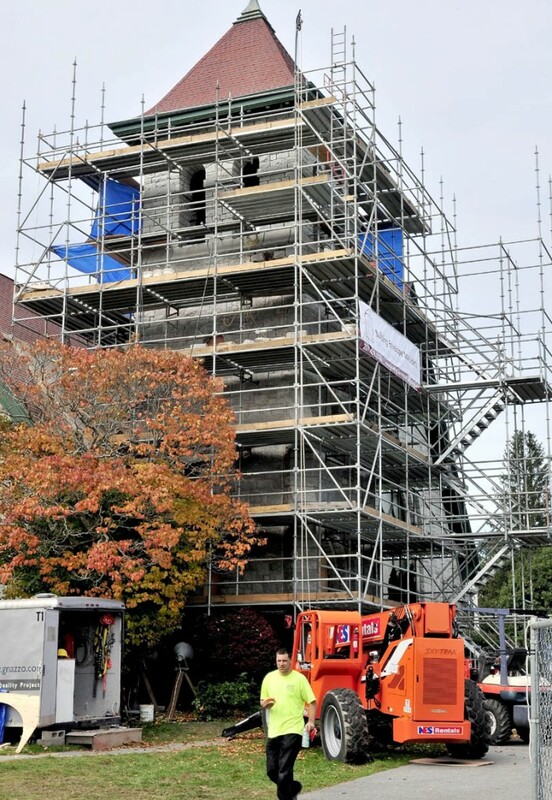 Brickwork is being done to the steeple, while the dirt floor in the basement is being covered with concrete. Among the few campus building casualties will be the Nutter Field House and the Tuttle Cottage, both of which Woodlee said have aged so poorly that it would have cost more to save them than to tear them down. Another challenge has been to plan the monumental task with existing staff. In the course of tackling the unfamiliar projects associated with the expansion, Davis and Woodlee said that they have learned more than they ever thought possible about the rules and regulations that govern the buildings on the historic property. Everything from construction permits to asbestos abatement is being learned about at a breakneck pace. The campus plans to add faculty and staff as the student body grows. The property is to the west of U.S. 201, and includes land from Martin Stream to Green Road. It also includes property to the east of U.S. 201 along the Kennebec River.